An ex-editor laments the death of the book—by writing a wonderfully observant novel about an editor whose career and way of life are both coming to an end. 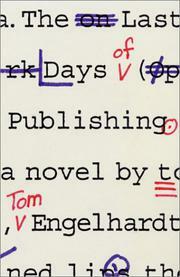 Having been a senior editor at Pantheon for 15 years, unsurprisingly, has given Engelhardt an easy command of the tone and texture of the publishing world, but the graceful abilities he also demonstrates in bringing character, place, and mood achingly to life must be the gifts of the man alone. Engelhardt’s narrator, Rick Koppes, has also been a New York editor for many years, at Byzantium Press—which has just been “swallowed up” by a huge media giant, the Desmond & Dickinson Publishing Group. For Koppes—aged 56, cultivated, sensitive, thoughtful—this beginning of the end of life as he’s known it contains also an unusual personal element: namely, that his own ex-wife of 20 years, Connie Burian, is one of the new firm’s top people and sees the future of the book in far, far different ways than does Rick. Only at story’s end will the true sorrow of Rick’s life—and his love—be revealed fully, but along the way there will be forbodings galore, some so simple as lunch with another editor, a decades-old friend, who’s been “remaindered”; a call from a hustler agent that, wonderfully, brings about a trip to the American Natural History museum and an unflinching consideration, among other things, of extinction; and, in the tiny hours after one odyssey-like day, a visit to the shabby West Side walkup of the conscience-ravaged daughter of one of the airmen who bombed Nagasaki—and who wants Rick to publish her book. Conscience, indeed, may also be Rick’s most notable trait, helping determine what he sees and what he thinks about what he sees—from the look of the new Times Square to the loathsomely smug boy-emperor and boss of Desmond & Dickinson. A brilliantly realized cri de coeur, pulsing throughout with life, sorrow, and thought.